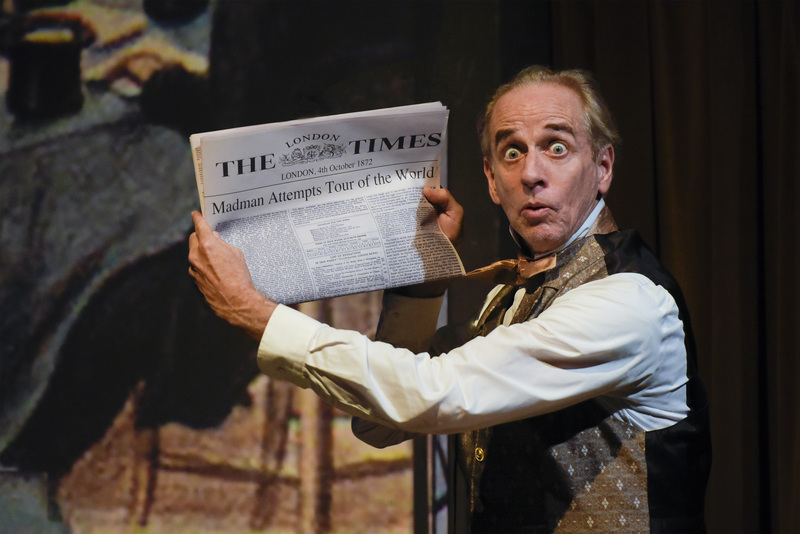 TheatreWorks presents Mark Brown’s adaptation of the 1872 Jules Verne classic novel, Around the World in 80 Days, and has audiences whooping at the antics on this whirlwind, 80-day adventure compressed into 120 hilarious minutes (including intermission). 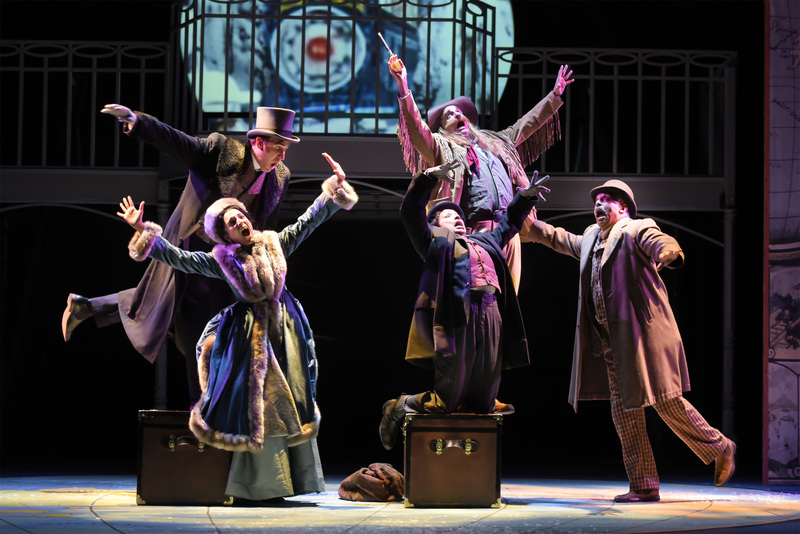 Although the show is billed as a holiday adventure, the only holiday aspects are the festive adornments throughout the house at the Lucie Stern Theatre, a bit of snow along the journey, and the timing of the target arrival home from the adventure. It’s good, clean, family-friendly entertainment that will have even the “grinchiest” audience member smiling. The adventure intertwines technology and romance across the globe in that bygone era of the late 19th century. Mark Brown’s adaptation is written to be performed by as few as five actors, or as many as 39, depending on how a company wishes to manage the character changes. TheatreWorks accepts the challenge and performs this piece with the minimum of five very versatile and agile actors. The route’s timing adds up to precisely 80 days, assuming every connection works as planned which any experienced traveler knows is far from a sure thing. Sure that this cannot be done, the members wager £20,000 that Fogg cannot complete such a trip within the allotted time. 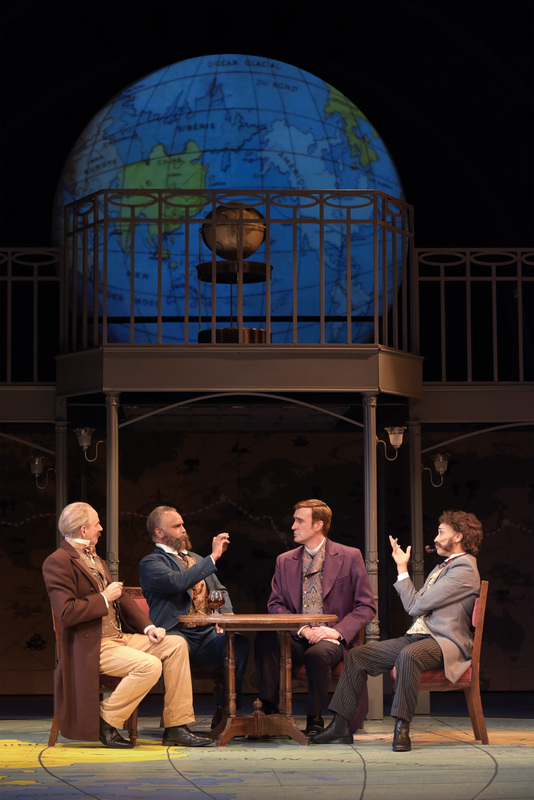 Fogg’s manservant, Passepartout (Tristan Cunningham), accompanies him, and Detective Fix (Michael Gene Sullivan) follows from London and dogs him throughout the trip. Fix believes that Fogg is a dastardly bank robber based on a rather vague description he receives from Scotland Yard. Along the way, Fogg and Passepartout free the lovely Aouda (Ajna Jai) from a certain sati death, and she joins the little band of adventurers. They encounter numerous officials and characters along the way portrayed by a combination of Ron Campbell and Sullivan. Foley and special effects artist Cameron Wells punctuates the story from the pit enhancing the action in a very palpable way. Director Robert Kelley has assembled an excellent cast. His staging accentuates the physicality of the piece, particularly for Cunningham’s Passepartout who is quite acrobatic at various points in the story. Although the script calls for a man who is small in stature in the role, Cunningham is a very adept woman playing Passepartout in all his glory. Aside from a voice pitched slightly higher than might be expected, Cunningham is very convincing in this demanding role. Her agility in the acrobatics is impressive, and outside of a slight inconsistency in Passepartout’s French accent, she is delightful in the plentiful witty repartee. 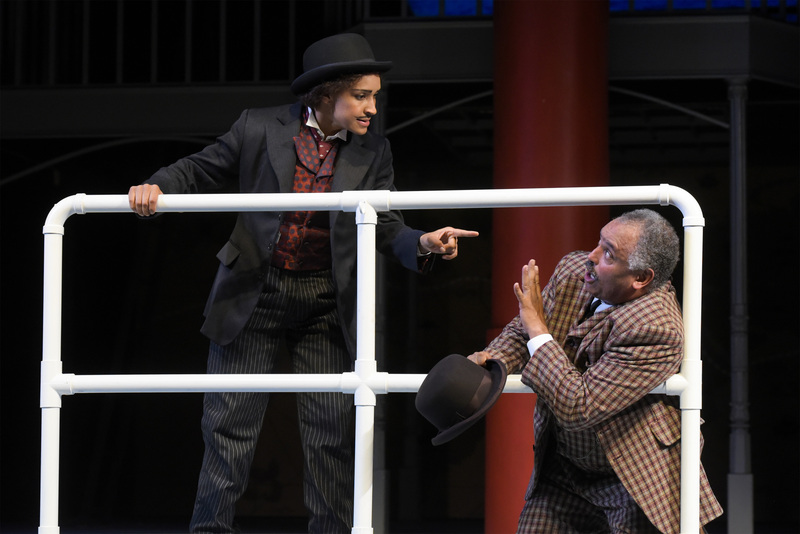 A favorite highlight in this uproarious script is the encounter between Passepartout and Fix when Fix stammers “Detec…um…ah…Fix” in response to Passepartout’s query as to his name. He is forever after doomed to be known as Monsieur Detecumahfix by Passepartout and Fogg. Kelley’s staging of the various traveling scenes, whether on a train, a steamer, or an elephant, is superb. The actors’ synchronization to indicate the motion of their vehicles is extremely smooth and convincing, many times adding to the physical comedy of the scene. Joe Ragey’s scenic design is festive, functional, and impressive. The artwork is detailed and informative. Panels adorn stage right and left with day-stamped drawings of the locations the travelers cross. These side panel drawings don’t change, and together, they map out the entire journey. The two-story center stage set allows for versatile use of the space to delineate trains, ships, and stops along the way. When things don’t go quite as planned on the journey and alternative transportation is required, Ragey’s design answers with slightly abstract and colorful artifacts. Cliff Caruthers’ sound design includes period appropriate music at times, adding to the intensity and humorous impact. Steven B. Mannshardt’s lighting design focuses attention, and highlights the actions perfectly. There are a couple of small imperfections in this production. 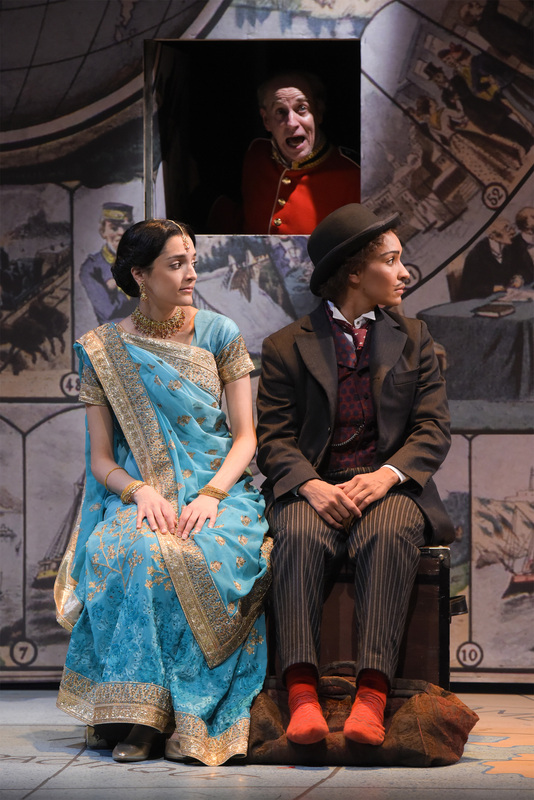 One of the more notable instances is Sullivan’s portrayal of various Indian characters while the travelers are on the subcontinent. Although his accent sounds convincing, it gets in the way a little as those characters are very difficult to understand. His demeanor fits in those portrayals, but some dialog is lost. His portrayal of Fix more than makes up for it in the end, as all of his utterances in that voice are easily understood. Fogg’s evolving love story is sweet, and chaste, and the resolution is satisfying and uplifting, appropriate to the season. If one is looking for a healthy dose of laughter and joy, this is a production that should not be missed. 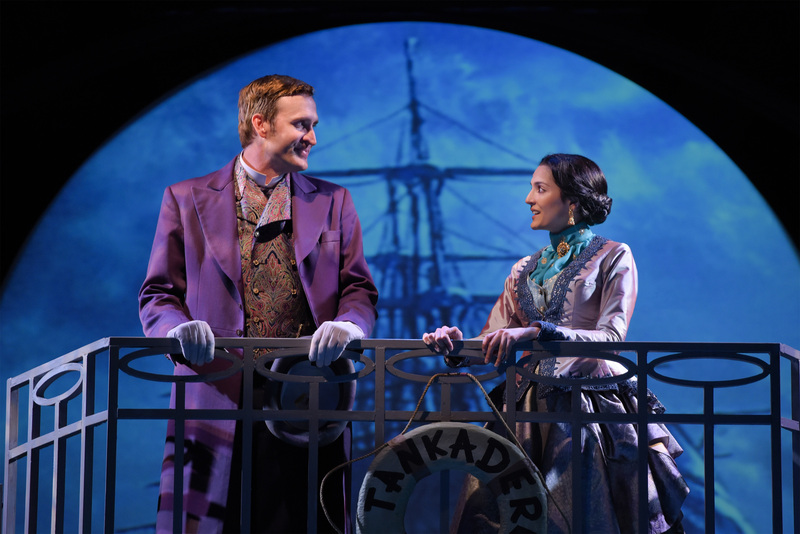 See http://theatreworks.org/201718-season/201718-season/around-the-world-in-80-days/, email boxoffice@theatreworks.org, or call (650)463-1960 for more information or to order tickets.